Pizza seems like a hard thing to mess up: dough, sauce, cheese – maybe a topping or two. But as we all know pizza CAN be messed up and the chances of this is greater when you’re buying a pre-made, frozen pizza. My experience with frozen pizza started and stopped with Mama Celeste and the last time I had that was as an after school snack with my sister so…it’s been a while. I will do an evaluation at some point with a couple of the next generation like DiGiorno to see how frozen pizza has evolved but today we’re kickin’ it old school. This doesn’t look like anything any mama would make, never mind the sweet old lady on the package. Ethan and I found this to be pretty tasteless. I felt the only ingredient that had any flavor was the pepperoni. Ethan was more disappointed by the lacking crust. As unimpressive as this was we did both agree that the distribution of ingredients were well balanced and I have to admit, I did like that it smelled like the pizza at rollerskating rinks, which brought back fond memories of skating around with feathered hair and playing video games, which was worth the $1.20 for the pizza. For all that Mama Celeste isn’t, Mr. P is less. Ethan found the dough kind of gummy, even though we cooked it according to the directions. The entire thing just lacked flavor all over and didn’t have enough cheese, although I’m not sure of that would have improved the product. No wonder he doesn’t show his picture like Mama does. Mama wins by a shred. It’s funny though how bland we thought that was and then after we tried Mr. P, we ate another slice of Mama’s just to leave this evaluation tasting some sort of flavor. But really, I think it’ll be another 20 years until I have Mama Celeste again, I don’t care how bad the recession gets! Mama Celeste or Mr. P? Hmm…Mr P looks better, but looks aren’t everything right? I guess I would go with the majority and say Mama Celeste. Please add none of the above choice – all of the low end frozen pizzas are just plain nasty!! 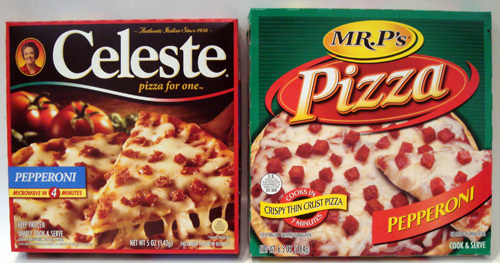 DiGiorno and Mystic Pizza are very good frozen options found in almost every conventional grocery store’s freezer. However, my favorite frozen pizza come from Trader Joe’s, specifically the Margherita, Spinach and BBQ Chicken pizzas. you know mama celete use fake cheese they don’t use a single shred of real thing. you gotta try american flatbread frozen pizza. it’s pricey, but worth every penny. People, the point of this was to compare 2 of the low-end microwaveable pizzas. Of course they aren’t going to be as good as any of the real pizzas you are mentioning. That being said, I couldn’t vote for this one. 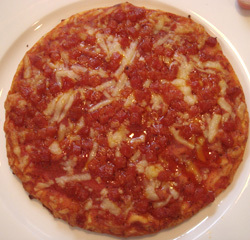 In the low-end quick pizza category, it HAS to be Totino’s Party Pizza! 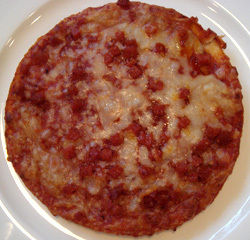 There’s a pizza *worse* than Marie Celeste’s? I have to try this Mr P stuff now. Though I hate them, Mama Celeste’s pizzas are useful to keep in the freezer for those days when you’re just too tired after work to do anything (of which I have plenty). I dig these kinds of “pizzas” no they aren’t gourmet, but that’s not the point. You don’t buy pabst for the taste and you don’t buy these things for the quality ingredients. You get it because it fills you and has a taste sort of like what’s on the box. digiorno is the only frozen pizza i’ve ever had that’s any good. everything else is disgusting. celeste tastes like burnt cardboard to me. XD; pizza’s not supposed to hold it’s shape when you lift it with one hand. and they’ve gotten even smaller and more expensive in recent years. I love Mr P’s pizza because it is cheap and it is good to have around the house as a quick snack. I always add some onions to mine and sprinkle some crushed red pepper on it, kinda makes up for the lack of flavor. Yall gotta be frickin kidding me. MR. P’S RULES! !